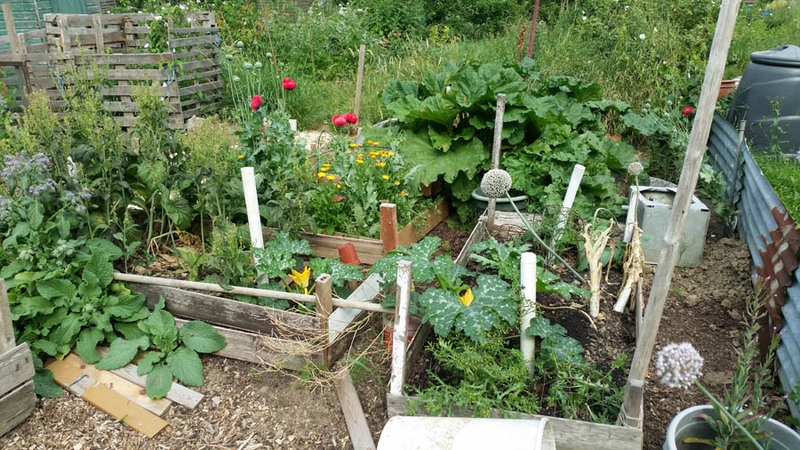 Many people in Britain are growing their own vegetables for the first time. In a country which currently only produces 60% of its food supplies, that’s always a good move. It’s taken the uncertainties of Brexit to bring this home. Emergency planning is the same motive that inspired me to create the Resilience Garden over a decade ago. I feel for those people out there at the beginning of their journey; the frustrations they will face and the triumphs they’ll enjoy! It’s all about soil. Look after it, feed it, don’t tread on it. Use raised beds, keep to paths. A planting chart on your wall saves having to leaf through books or websites with muddy hands. If you don’t have an outside tap, fill a bucket with clean water ready to rinse your hands. You’ll need them clean and dry to handle seeds. Look after your tools; give them a wipe and put them away at the end of each session. If you’re using stakes, cover the ends with padding so they don’t poke you in the eye. It’s hard to see them from above! 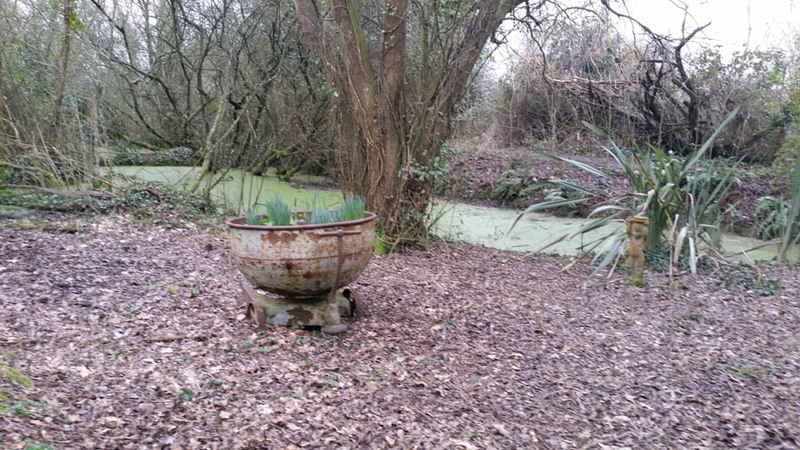 Collect old buckets and basins. Placed strategically around the garden, they will harvest rainwater for you, saving a trip from the tap. Make sure wildlife can escape from the water, and watch out for slugs moving in underneath. You have to squish slugs and snails. Sorry. Once hedgehogs and thrushes would have done the job for you, and if you poison your pesky molluscs this day will be so much further away. You also have to thin out vegetables like carrots. Steel yourself to compost those little baby plants! Avoid this trauma by becoming an expert at sowing thinly. Cultivating vegetables is a compromise between what you like to eat and what the garden wants to grow. Allowing the garden to win gives you much less work. Leeks are just as useful as onions. Do not dig up your potatoes to see if they are growing! ‘Recipes for Resilience‘ covers the whole growing year, with gardening tips, seasonal recipes and historical background. I’m excited to announce that the typeset draft has now arrived on my desk, so a publication date will be available soon. Meanwhile, I’m having to change publisher for the Resilience Handbook as well – if you want one of the limited first edition copies, order now! Certain seagulls, who lay single eggs on cliff faces, prefer larger eggs to smaller. This can be observed by providing gulls with false eggs to nurture. They will reject their own egg in favour of one so large that the bird looks ridiculous trying to cover it. There wasn’t any need to programme an upper limit into this genetically controlled behaviour. There were other limits on the size of egg likely to be laid, and no other birds of that size used this precarious habitat. Humans are social creatures. Alone, we are poorly equipped for survival compared to other animals. Small family groups are also vulnerable, due to the long periods of child care required. In general, the larger the group, the better. Genetically controlled behaviour leads humans to feel more comfortable as part of a large group; other limiting factors controlled group size. Most isolated humans would feel impelled to join a group, the larger the better. Advertisers, religions and political parties exploit this impulse to the hilt. Join our label, be part of our congregation, follow our leader! Such unfeasibly large groups must sever their relationship with the land which supports them, such that other instincts like resource conflict seem irrelevant. These instincts do not go away, however, but simmer deep in the subconscious, informing behaviours which seem incomprehensible on the surface. Competition for territory comes mainly from members of your own species, who require exactly the same resources as you. An expanding tribe would eventually encounter the borders of another group. Conflict might ensue, each group against the ‘other’. In modern times, this was played out in destructive wars between nations. Now that it is far too dangerous to fully indulge this, different ways of identifying the ‘other’ are employed by primitive instincts trying to surface. In the absence of clear group markers, this leads to confused behaviours. These instincts, around the potential of resource scarcity and the need to defend a ‘territory’ which cannot be defined, need to be brought into the open and dealt with honestly. We have indeed exceeded the carrying capacity of the entire planet, by a good long way, and urgently need to manage ourselves down from that while we can still prop up the process with non-renewable resources. There’s no point looking at Science for answers. Science put the solution on the table back in the Sixties – efficient, cheap family planning. If we’d prioritised resilience over economic growth in the Seventies, Britain would be in far less trouble now. We may even have achieved the Age of Leisure as depicted in old science fiction novels, instead of having to work harder than medieval peasants. However, it’s better to cry over split milk than to try and put it back in the bottle. Although it’s past time for an easy answer, there is a way forward. Start at ground level, resist the allure of labels, and consider what you couldn’t do without. Food, water and electricity are a good start. Grow a resilient, sustainable civilisation underneath the worn out ways; the old will fall away like a broken eggshell as the new emerges. I’ve done my bit by writing ‘The Resilience Handbook – How to Survive in the 21st Century’….now you need to read it! Things have felt pretty relentless this summer – no sooner have I dealt with one thing than another challenge comes forward! Many other people seem to be experiencing the same problem; if you’re one of them, I think October should be a bit calmer. It’ll be a ‘new normal’ though. 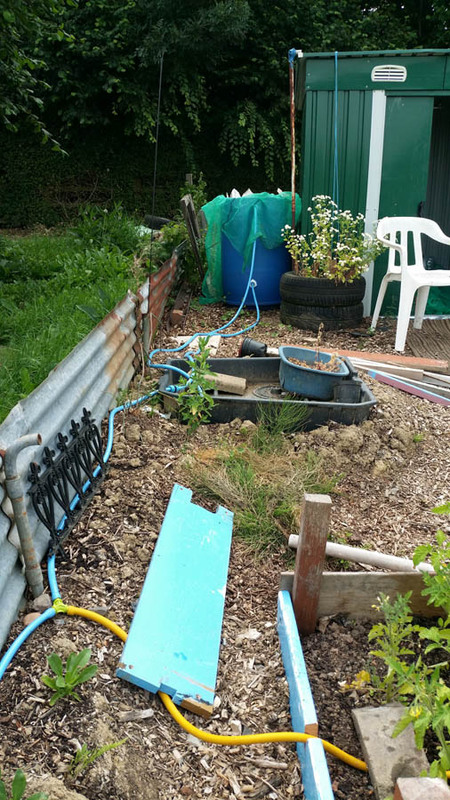 With the struggle to keep the vegetables watered, we’ve had to let half of the Resilience Allotment go. The soil isn’t only poor, but infested with smothering weeds and disease. 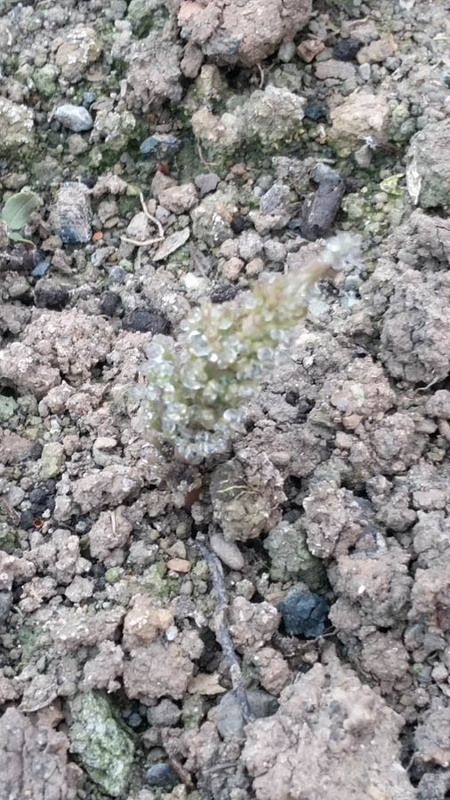 The brassicas succumb to a white mildew, peas dislike the exposed site and potato blight is endemic (because it’s ‘such a good idea’ to plant sprouting supermarket potatoes). Beans, garlic and courgettes do well, and the raised beds used clean soil imported from the Resilience Garden so the potato crop was small but healthy. Due to years of selective weeding, this soil is full of seeds from edible plants. Left unattended for awhile, borage, marigold, rocket and spinach flourish. Unlike the perennial weeds they replace, these plants can be pulled up easily and composted. Towards the end of autumn, I’ll clear the ground and plant broad beans and garlic. Instead of the allotment area, I plan to build a few more raised beds in the garden. It’s easier to cultivate food plants nearer home when you have a busy lifestyle! 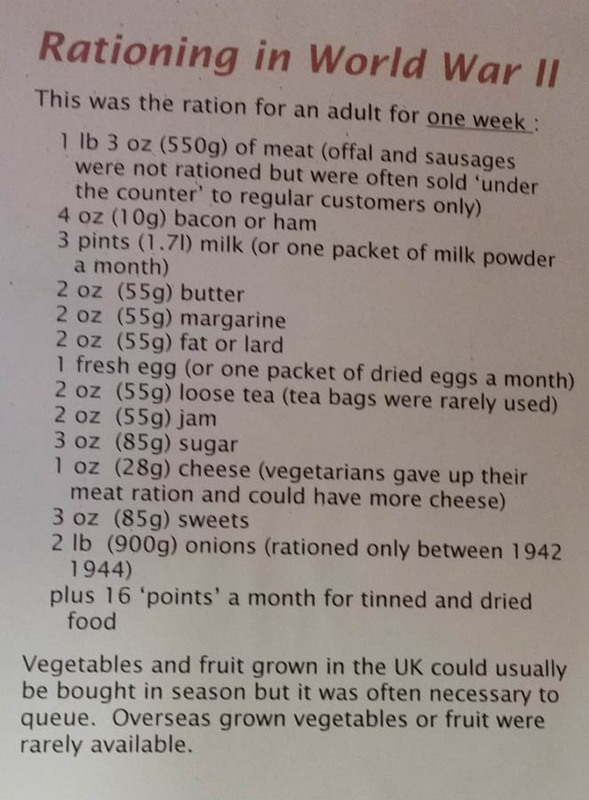 However, growing just that bit of extra food has meant far less trips to the supermarket, with a considerable saving in money. I got caught out the other day though. Hungry, and with a day’s wages in my pocket, I popped into the local supermarket to get a little piece of steak and some mustard. The bill for all the things I didn’t really need came to over £25! And I forgot the mustard! Food is a major part of community resilience. It’s such a large subject that I had to write another book (‘Recipes for Resilience’ – out soon!) just to cover the basics of gardening and cooking. Travel, on the other hand, benefits your personal resilience, as well as providing a welcome break from a dull or oppressive routine, You don’t have to go far – take a picnic lunch and buy a Day Explorer bus ticket. Pretend to be a tourist in your local area for the day. Travel takes you out of your comfort zone and lets you practise carrying just what you need to get by. Combine it with attending a workshop on your chosen craft, or even go on a survival course for maximum resilience! So that’s why I write a lot about food and travel. There are many other aspects to practical resilience however, and I’ll spend some time this winter going over the other sections of the Resilience Wheel. The hot dry weather continues. Here in Somerset, we’ve only had about five days with even a light shower of rain since Easter. It’s been a relentless round of watering; not so difficult in the garden, but a real challenge down at the allotment. This gravity fed system delivers a trickle of water to the tomatoes and courgettes, but the barrel has to be topped up manually. 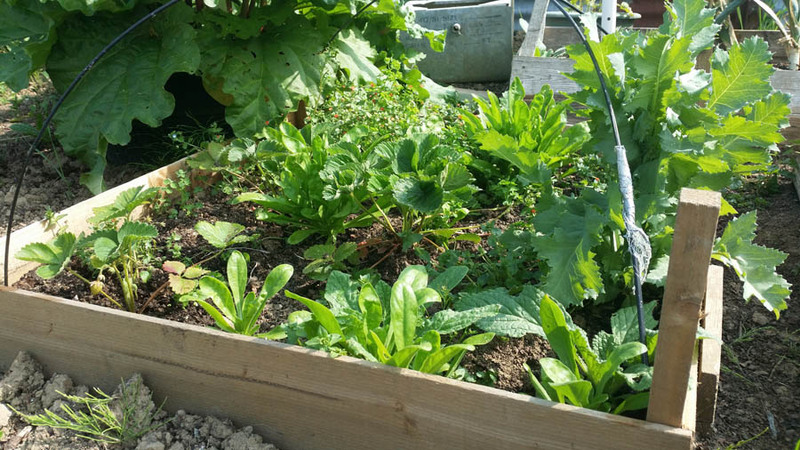 The raised beds are filled with a mixture of leaf mould, shredded paper and soil imported from the Resilience Garden. This is full of seeds from useful, fast growing annuals which are shading out the perennial weeds. Borage, marigold and poppy can be seen in the picture; lower ground cover is supplied by scarlet pimpernel and blue speedwell. These are easy to pull up, and good to compost, unlike the bindweed, horsetail (outwitting vertebrates since the Triassic) and couch grasses they replace. 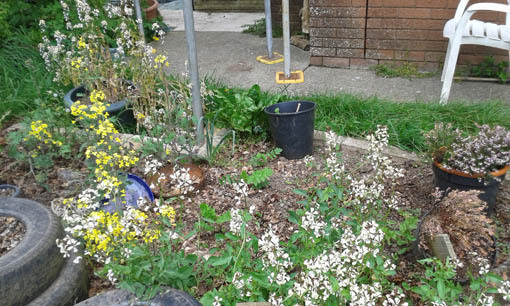 Most of the weeds have to go to landfill just now, which deprives this poor soil of even more nutrients. 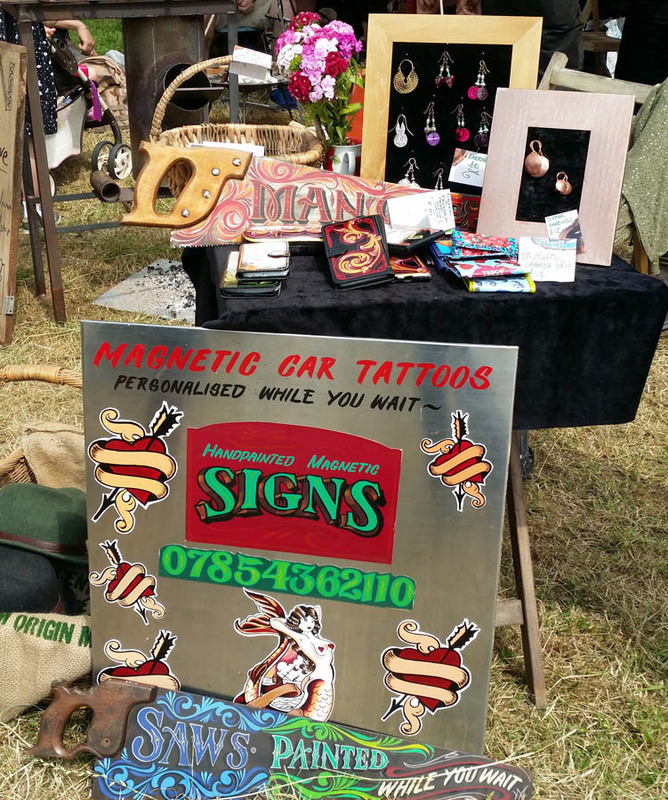 We took some time out to go to the Scythe Fair in June. 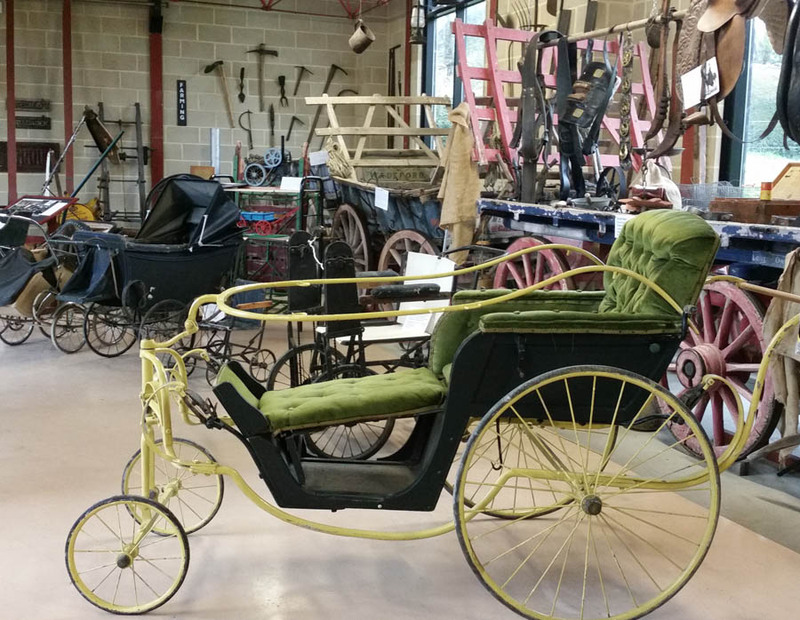 Adventurous visitors could sail down the River Parrret and catch the horse drawn bus to site! ….or perhaps not. Suppose it was possible to close the whole lane for a day, so visitors had to leave their cars (in a convenient field) and walk or cycle to the event? The locals would need to go along with the plan too, and not use their cars for a day. The management felt that was too radical a concept – and I agree. It’s a shame that everyone is so attached to their cars! I’m just about to set off on another adventure, spreading the Resilience word …more when I return! In my father’s day, few men in the newly created suburbia lacked a garden shed. The sharp tools and poisonous chemicals, which were still part of everyday life, allowed a ban on children entering. The shed was a haven of orderly peace. The men justified its existence by repairing household goods and DIY projects. They could indulge hobbies; many people were still quite skilled at craft work. The consumer culture disposed of the first two functions. Dispirited, the lure of the TV replaced the last. When the neglected shed finally collapsed, decking took its place. Essentially, these are community workshops where a group of people meet up to work on their own projects. Rather than an actual shed, which might not be large enough, many are housed in portacabins or empty buildings. Most members, but not all, are retired men. The UK Men’s Shed Association was founded in 2013, to provide an umbrella group for the thirty sheds already established. Today, there are over 400 in operation, with another 100 in the planning stages. The Sheds mainly provide workshop space and tea. 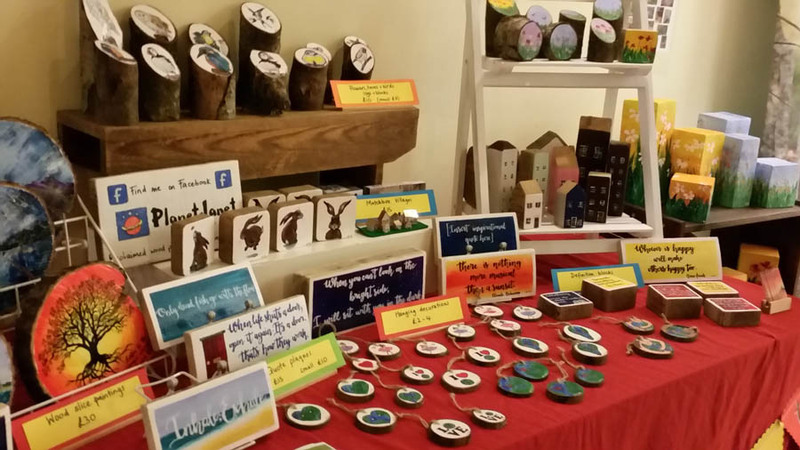 They host a wide variety of crafts – wood and metal working, electronics, model-making. Other community organisations soon learned that they could ask for tools to be fixed, or equipment made. 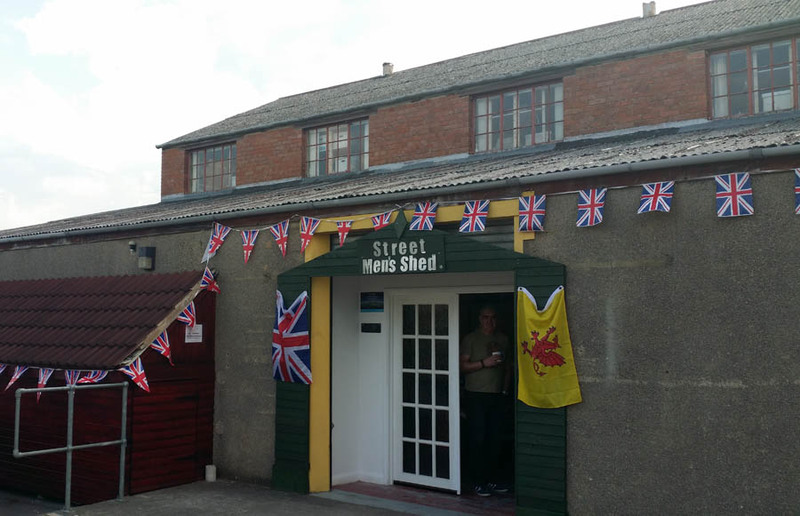 Often adapted for disabled access, the Sheds are providing a valuable resource for care services. The Association’s website has a map showing your nearest UK Shed, and a resource library to help you start one. 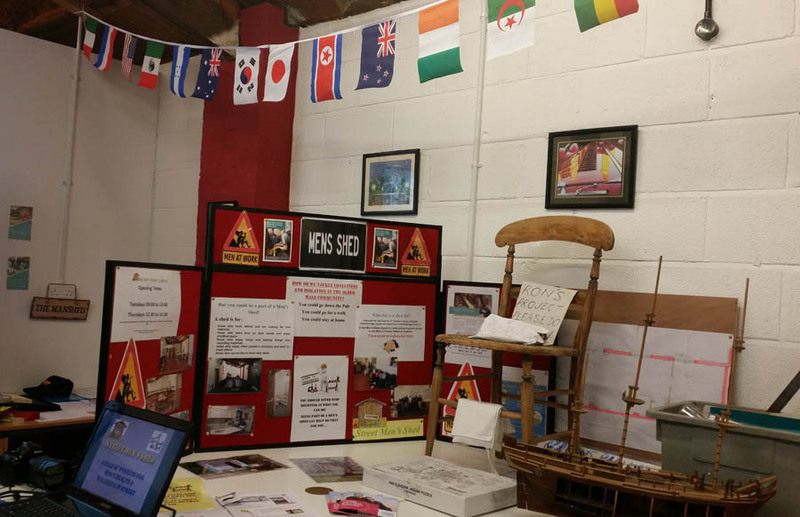 Street Men’s Shed in Somerset, who hosted the remarkably well attended AGM in the pictures above, take their information stand to local events. Shed days welcome drop-in visitors, though you may need to be a member to use the facilities; there will be a small charge. The Reskilling section of the Resilience Handbook outlines the importance of keeping craft skills alive. If you’re following the Resilience Plan, you can see how becoming involved with this group will cover everything you need to know in this section and a great deal of the Community section too. Achieving a useful level of resilience isn’t hard – it just requires the sort of gentle steady progress so unfashionable these days. A community, town or nation which values resilience doesn’t need public campaigns to live a sustainable lifestyle. Everybody understands where their resources come from, and that payment isn’t always to do with money. The true goal of a resilient community – and this is a long way off – is to be able to survive on its own, with no imports of goods and no exports of waste, for a year. Once you begin working out how this could be possible, it’s clear that we need to start progress to a smaller population. It’s not so hard to keep a form of internet going, even in a low-technology situation. Perhaps we could finally depart from the city-state model, which always ends in environmental degradation and the obliteration of a once-proud culture. Most emergencies you’re likely to encounter are simple domestic ones. If you lock yourself out, you’ll need a locksmith. Here’s some simple precautions to take, and a few things to try first. Sometimes things may get more serious. Suppose you’re snowed in and can’t get to work? Take a look at this guide to your legal position – as both an employee and an employer. 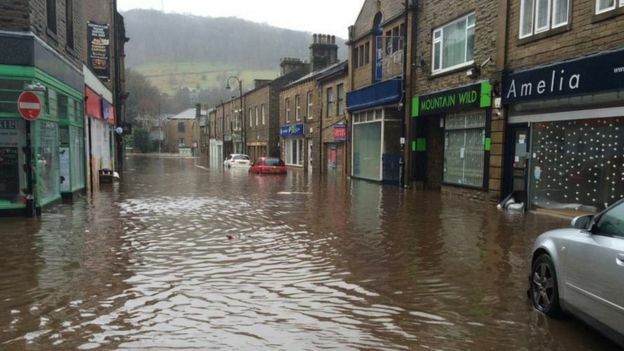 Is your area at risk from flooding? What should you do? Do you know how to turn your utilities off safely? You can protect your home better if you understand these basic principles. Keep a camping stove and a portable heater; if you don’t have room for the latter, some hot water bottles at least. A large flask is also useful. Have a store of food and water – its size depends on how much suitable space you have. In the UK, the National Health Service and the Government websites will be used for emergency announcements; you could bookmark them. Announcements can also be made on local radio – it’s a challenge to list all the local radio stations in the UK, but Wikipedia have had a go! If you’re evacuated, you’ll need a grab bag; keep this ready packed and check it once every few months. American preppers are always good for practical survival tips; here’s instructions for assembling a first aid kit. On the subject of medicines – always take your medications and a copy of the prescription with you in an evacuation! You may expect to be gone for only a couple of hours, but these situations have a habit of escalating; pack for at least one night away. There are many ways you can contribute to forming a resilient society, but keeping a grab bag ready is only a small chore. There may not be much time to escape a flood, so people who are ready to go are really helpful. 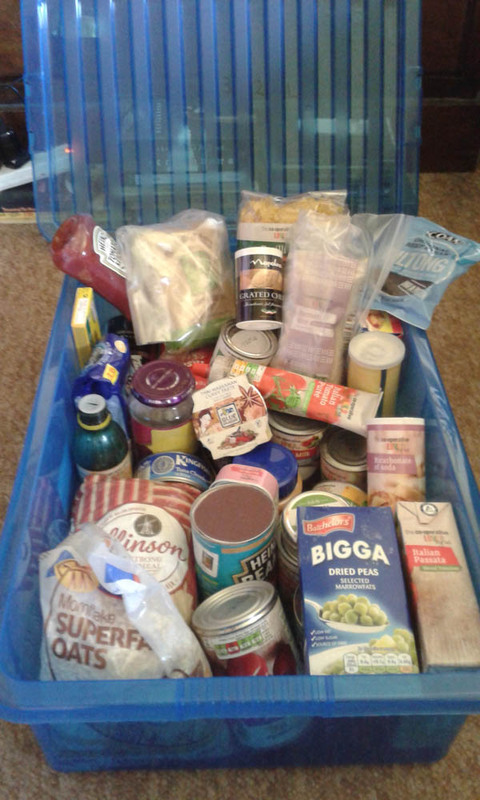 If you’ve packed some useful things to share – a deck of cards, some sweets, a spare torch – things can go much better during the long wait at the evacuation centre. And, if there’s never an emergency….take your grab bag out on a camping adventure and see how it works for real! Wild garlic, or ramsoms, is growing in profusion now. It can be used in many recipes, added to soups and stews, or washed and munched raw. 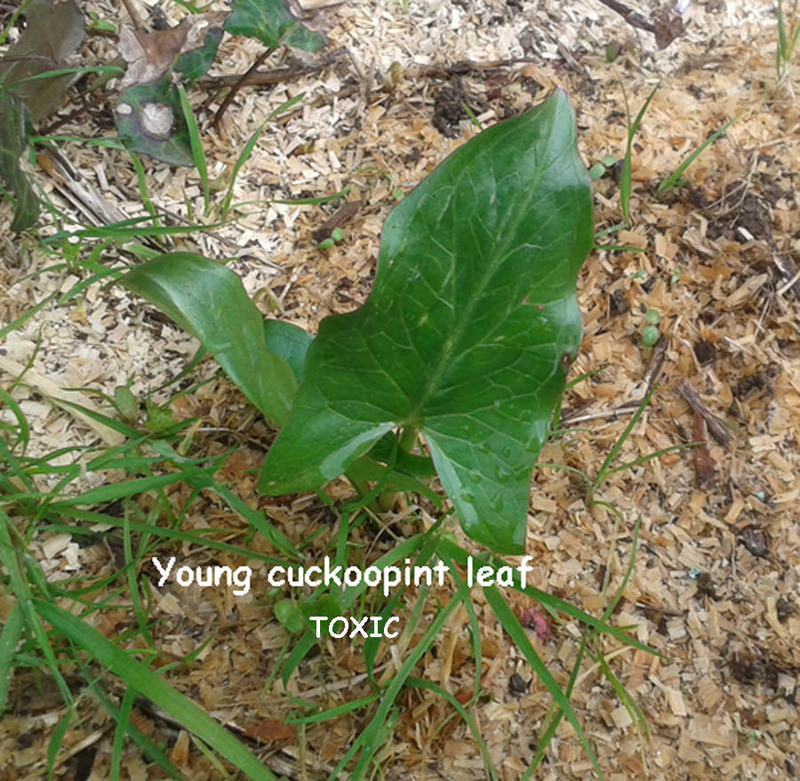 Below is the young leaf of a Cuckoopint, or Arum Lily. These often grow in the same patch as wild garlic – weed them out of your own forage area. Pay attention to the leaf veins. They are branched, as opposed to the garlic which has parallel veins like a grass blade. The arrow shape becomes more pronounced as the leaves mature. If you eat cuckoopint by accident, it will cause a burning sensation in your mouth which can last for several days. Bluebell comes out a little later, so it’s fairly easy to tell the leaves apart from wild garlic, which will be moving into the flowering stage by then. It occupies the same woodland habitat as the garlic too. All these leaves vanish completely in the summer, except for the cuckoopint which goes on to produce its vivid orange berry spikes. These are also poisonous to humans. No sign of any of these plants is visible in autumn and winter. 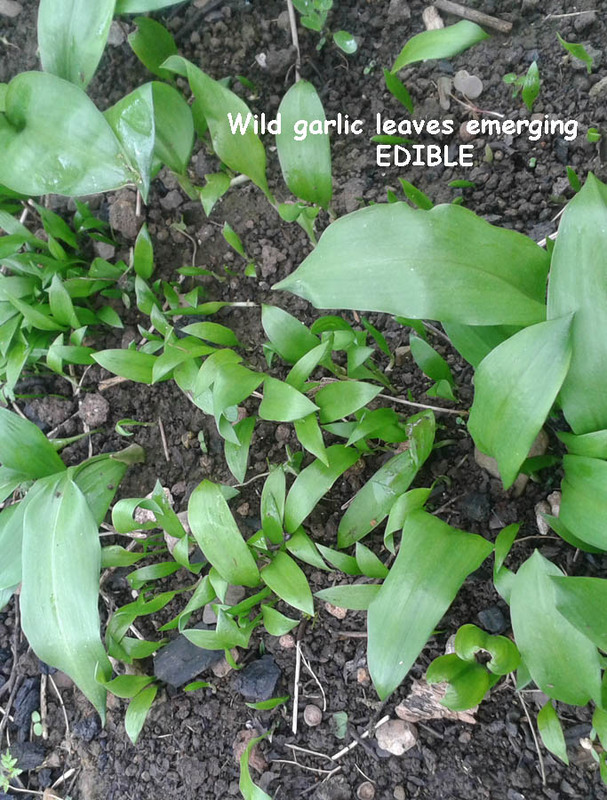 However, the edible bulbs of the wild garlic are still there underground. 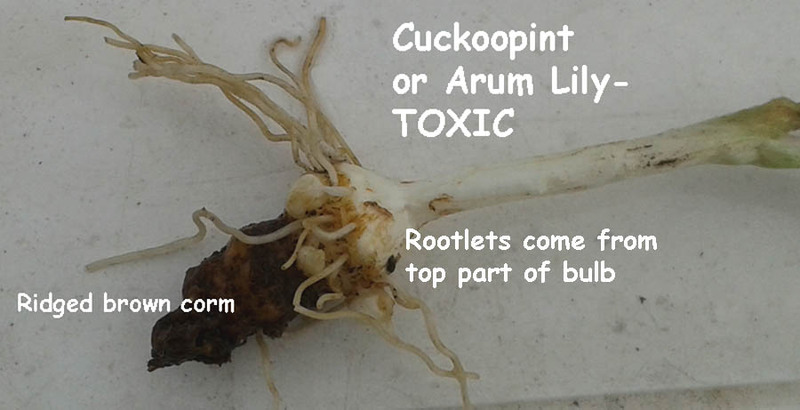 When learning this plant series, it’s identifying these bulbs which you should concentrate on. Without any other clues, it could be tricky; you need to avoid including cuckoopint or bluebell in your forage. Establish specimens of each in pots and watch them grow. Dig up some roots and study them. Wash your hands after breaking up the cuckoopint; if you have sensitive skin, it may be worth wearing gloves. Once you have thoroughly learned all three, you are equipped to forage for them in the woods, should you ever need wild food. In order to protect these important plants, it is illegal to dig them up in the UK without the permission of the landowner. Hence you should grow your own for study. When you do, you will observe that the tiny first-year roots of all three look much the same – an oval white bulb about the size of a match head. 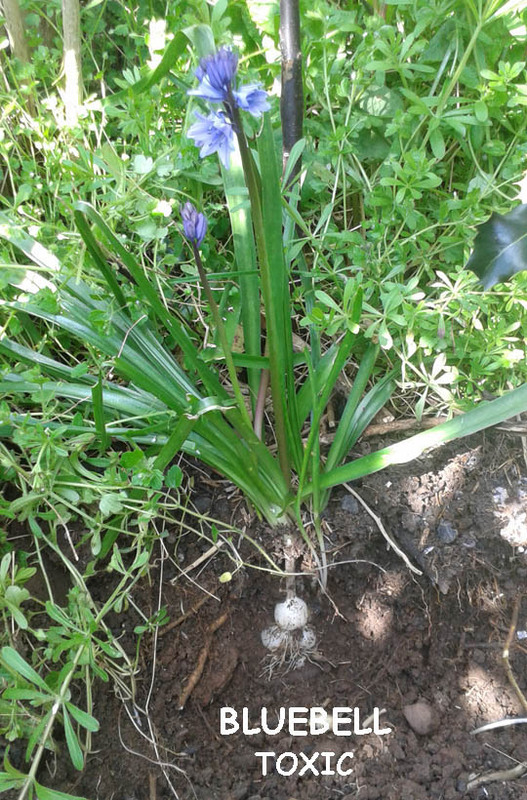 Only gather the larger wild garlic bulbs which have developed the brownish root skin. Action task 9 in the Food section of the Resilience Assessment requires you to go on a walk to identify edible wild plants. Look for wild garlic in local woods or under trees in parks. 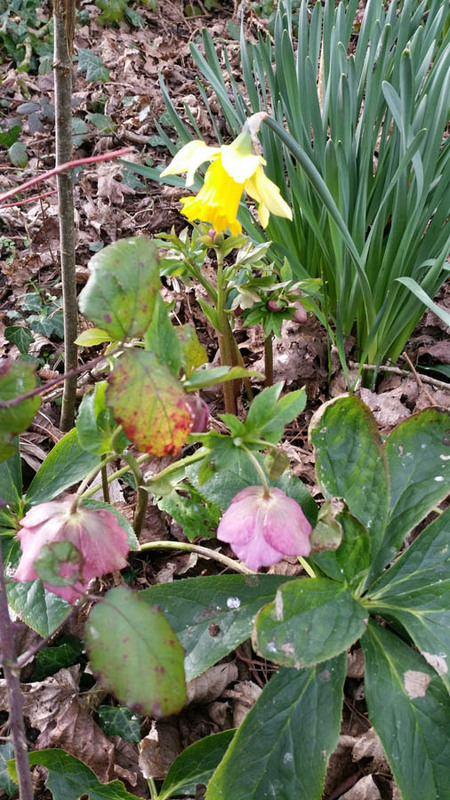 Are there more plants which grow in that area, such as daffodils, which you need to be confident of identifying? The simple questions in the Resilience Handbook encourage you to establish a layer of underpinning knowledge upon which you can build your resilient lifestyle! Earth Hour is an annual event which celebrates a global network committed to creating a sustainable world. It’s organised by the World Wildlife Fund, and began as a ‘lights out’ event in Sydney, Australia in 2007. The idea is for people, organisations and businesses to turn off all non-essential lights, and other electrical devices, for one hour. The hour begins at 8.30pm local time, so the effect ripples around the world. City landmarks, such as the Eiffel Tower and the Shard, participate now, as well as millions of individuals. 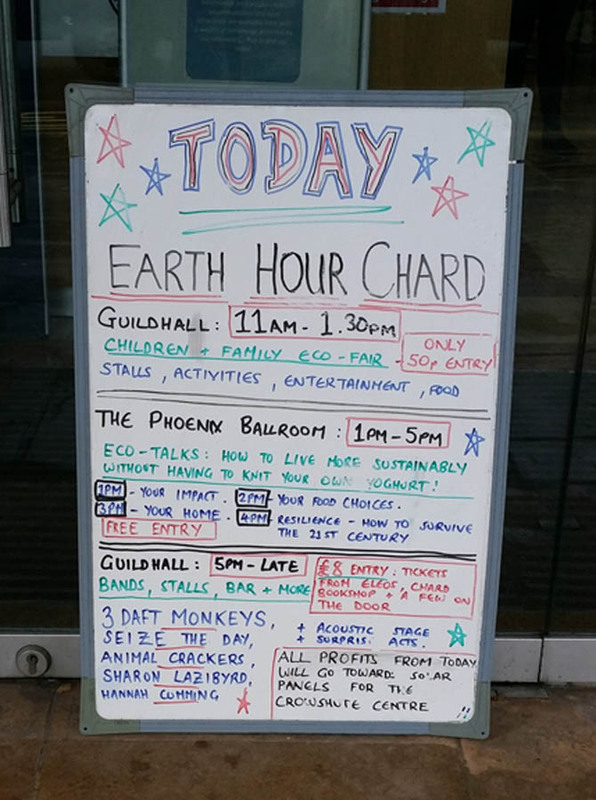 Some people organise whole events around the occasion, and one such is Earth Hour Chard where I was booked to talk about Resilience. Their first event had been a magnificent street fair, betrayed by a bitterly cold March wind. They’d hired the Guildhall this time, for a whole day’s programme of activities supported by a cafe, bar and numerous stalls. I arrived early; the kids’ activities were in full swing. Everyone was busy, so after I unloaded and parked, I took a walk to the museum. In a county of farming communities, Chard always stood out as a factory town. The textile industry was important, particularly machine made lace for net curtains and clothing. 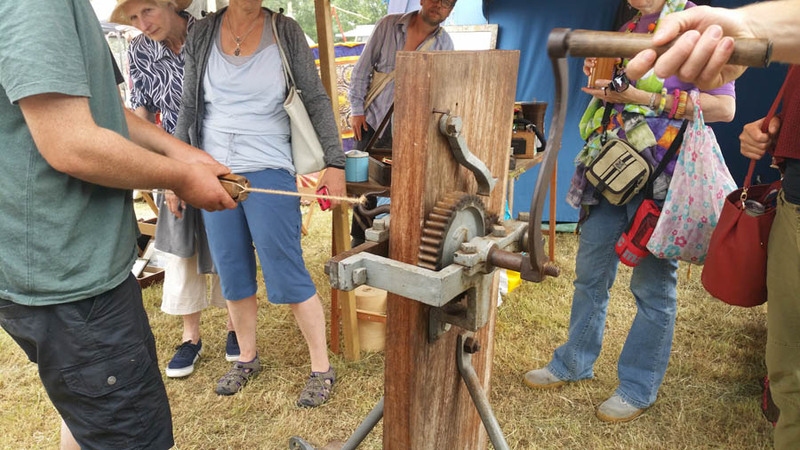 As outlined in the Resilience Handbook, the presence of machinery in the area encouraged a support network of craftspeople. These skills were then available to inventors. It was in Chard, in 1848, that John Stringfellow’s Aerial Steam Carriage first showed that engine powered flight was possible. Other major advances credited to the town include the development of articulated artificial limbs and of X-ray photography. Today, it’s the home of the Henry vacuum cleaner. 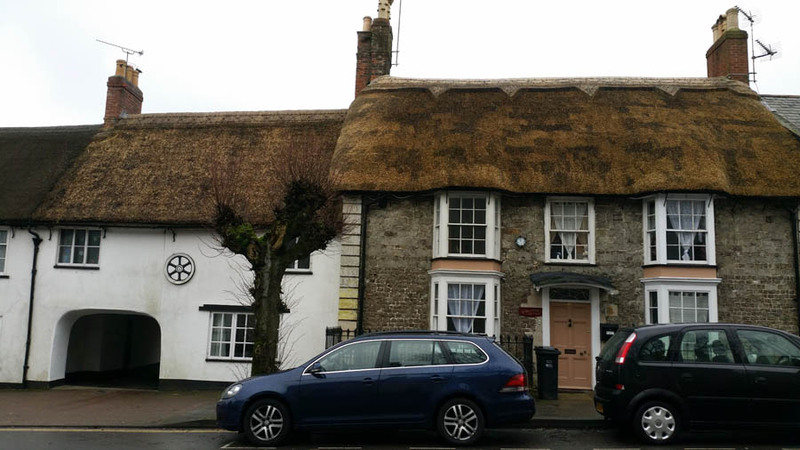 I strolled down Fore Street, admiring the remaining old countryside architecture, the thatched houses and diamond pane windows, arriving back in time for the judging of the colouring in competition. 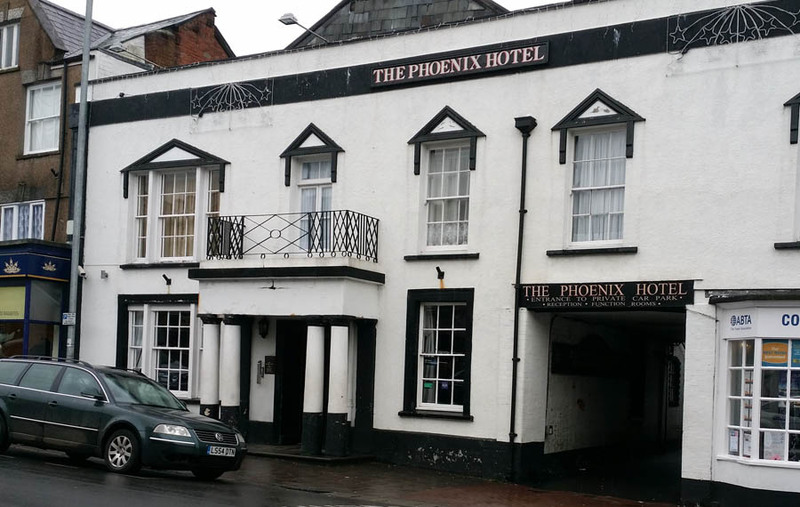 I hastened over to the Phoenix Hotel; the talks were being held there while the Guildhall was set up for the evening event. 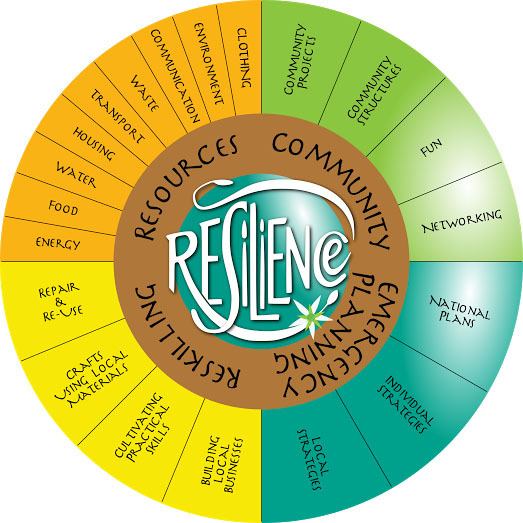 I’d decided to create a new talk, outlining how the Resilience Project came into being through a fusion of Transition’s Energy Descent Action Plan and local emergency planning, with decades of experience in living off-grid thrown in. Jason Hawkes covered ecological footprints and housing; Kate Handley talked on local food. We packed up in time for the music; a selection of bands often seen at off-grid festivals, compèred by Tracey West, publisher extraordinaire. Simon West manned their Word Forest Organisation stall on the top floor, where the poetry slam was going on. It was a very entertaining evening, networking and enjoying quality performances. We didn’t turn off the lights in the venue for Earth Hour – a health and safety issue – but at least the people attending had turned theirs off! 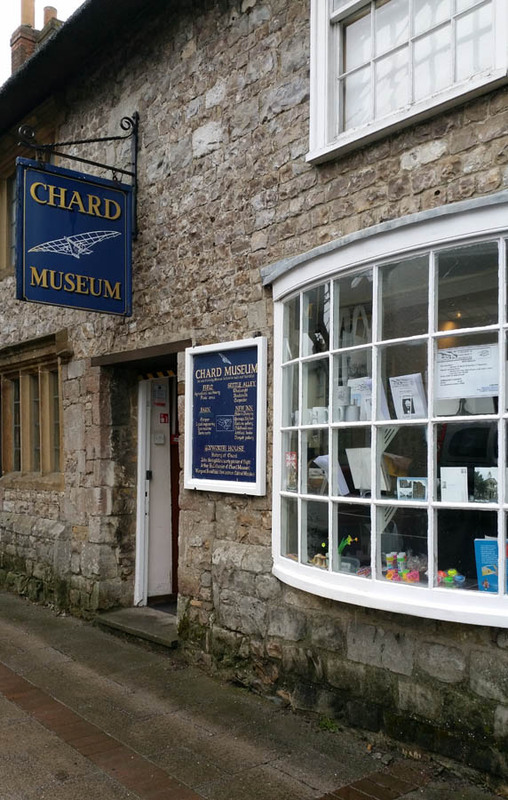 Although Chard is poorly served by public transport, it’s worth a visit. I found some charming hotels with reasonable prices, though in the event I stayed with one of the organisers. Check for parking, as this may be a local issue. 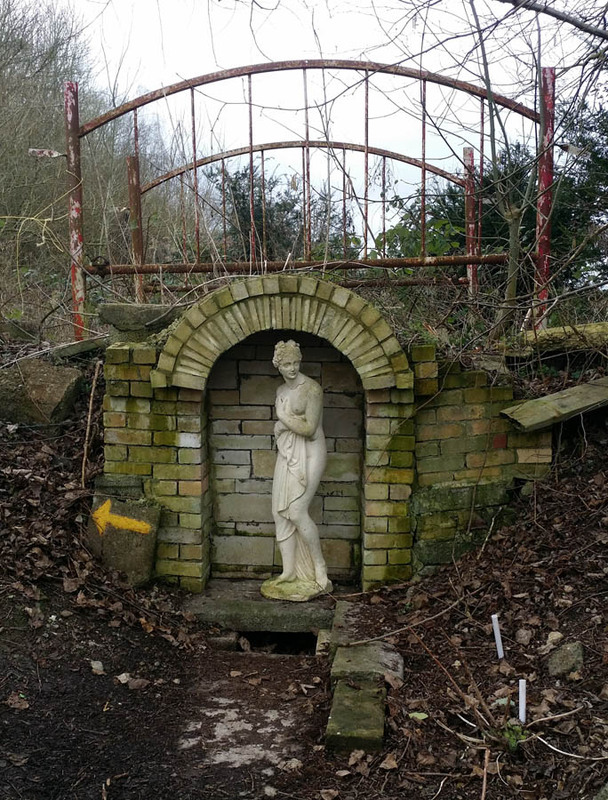 Sadly, the nearby Wildlife park at Cricket St Thomas has closed and is now on the Heritage at Risk register. The Somerset Levels are flat, and barely above sea level. 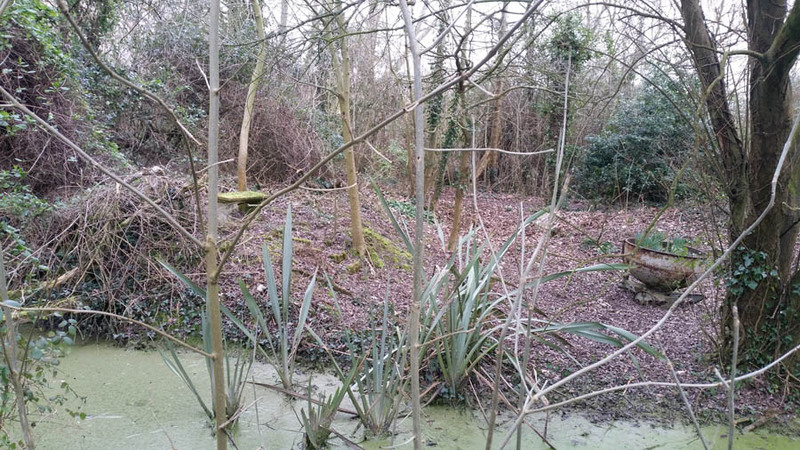 Most of the land is drained now, to form cattle pastures, but it used to be a mix of swamp, wet woodland and bog. The value of the latter is now becoming appreciated for its role in flood control. 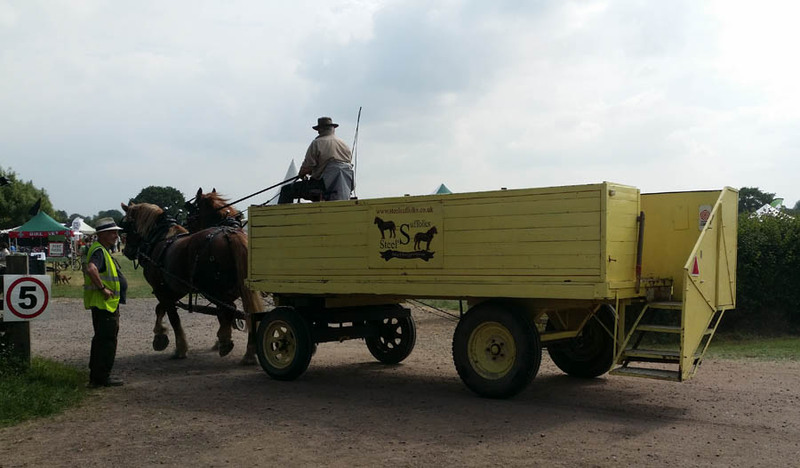 Towntree Farm is decades ahead of the game! In the 1970s, farmer Chris Burnett began a visionary landscaping project on the family farm. Starting small, with a pond outside the farmhouse, he used the spoil to form a lawn, then landscaped a neighbouring field in a similar fashion. 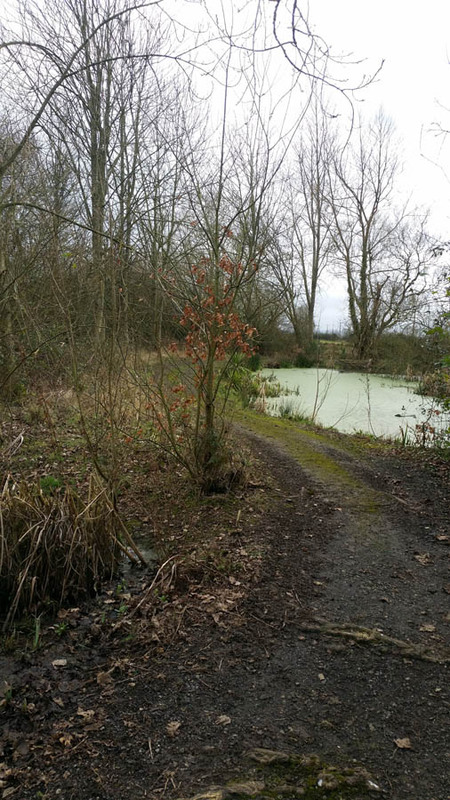 The left over soil made pathways this time, and the pond soon attracted a breeding pair of swans. 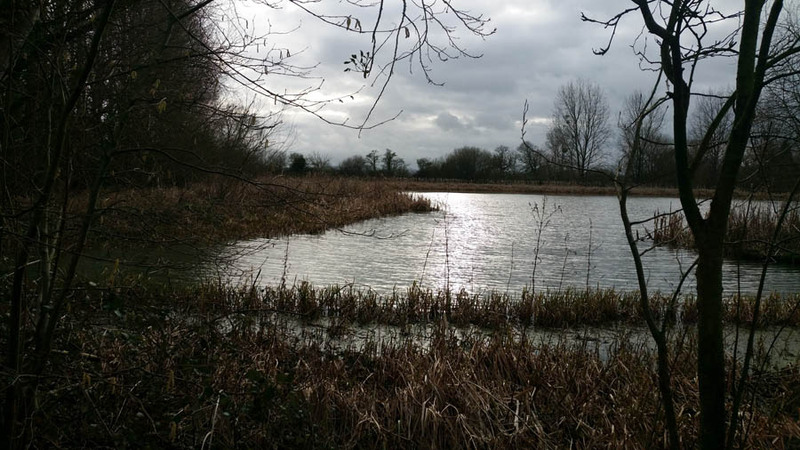 Encouraged by this, Chris dug out a seven and a half acre pond, specially designed for water birds. It’s quite shallow, which allows a good growth of reeds. He planted the new high ground with trees and plants, both wild and cultivated. Once these became established, hundreds of migratory birds began to visit, and he has hopes of attracting a pair of cranes soon. 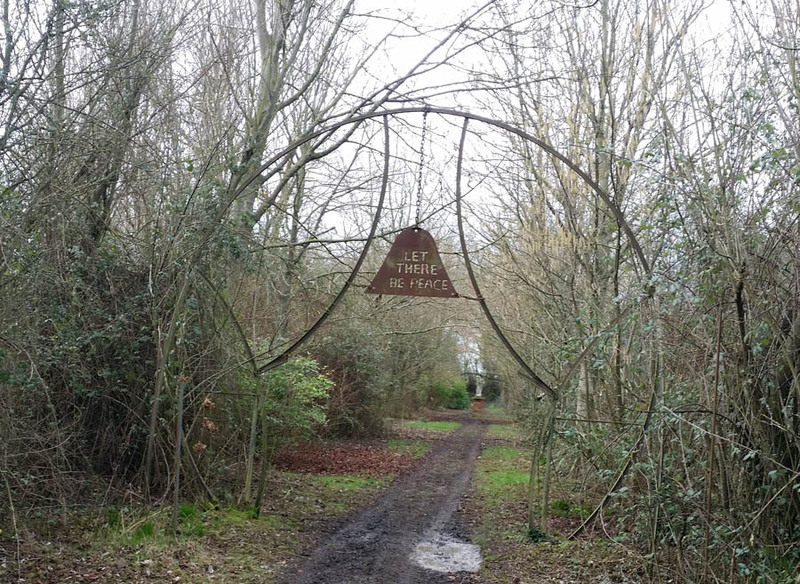 In 1987, ‘Capability’ Chris – as he had become known – was persuaded to open the 22 acre Nature Garden to the public. He celebrated this by making a ‘Peace Arch’ at the entrance from the car park, which is covered with climbing roses in summer. Following the yellow arrows, the curious visitor traverses the winding paths. It’s not just the peaceful atmosphere and nature that bring people here, though. 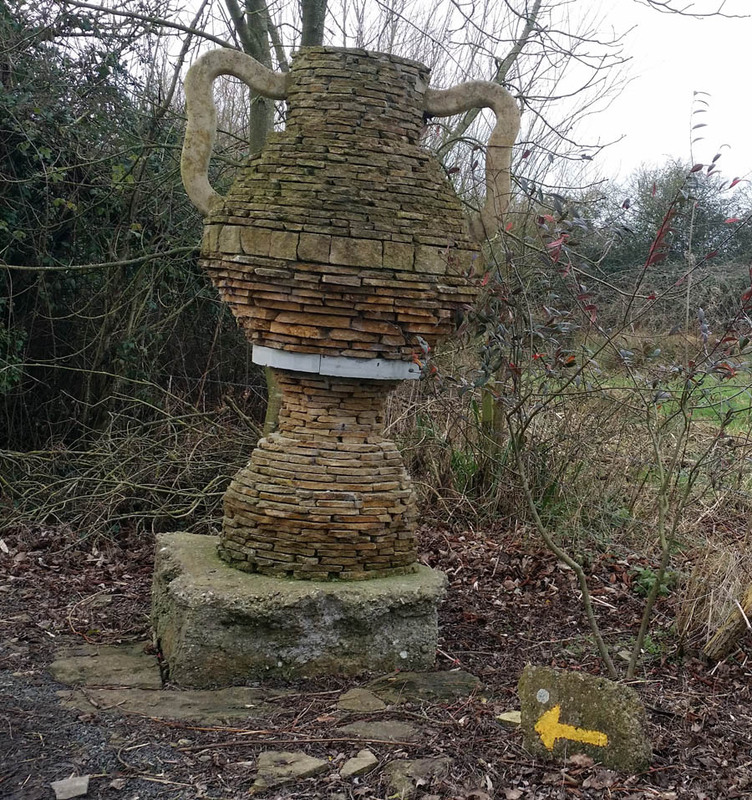 The trail is dotted with statues and sculptures, left to gradually merge with the wild. 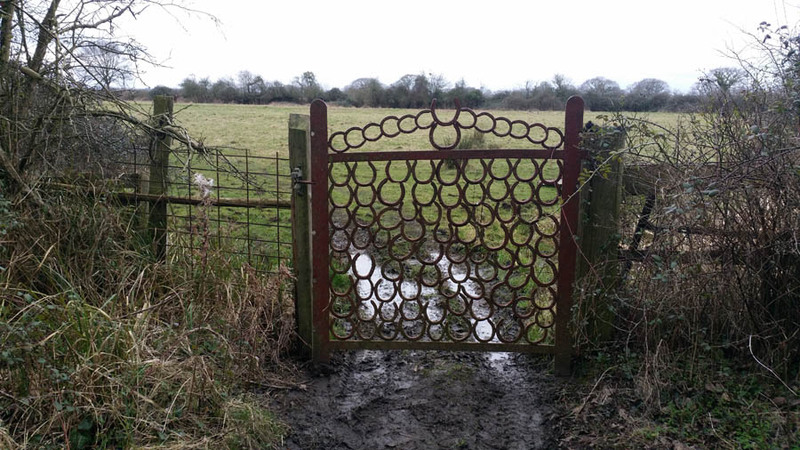 As the path meanders, bordered by ditches, you can see inaccessible alcoves. Further on, the twists and turns suddenly bring you out into that very clearing! 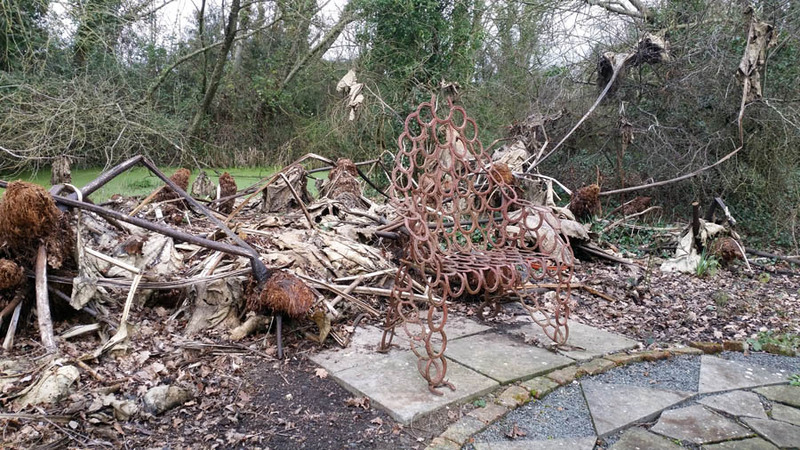 There are benches made of stone slabs, or of dozens of horseshoes welded together. I don’t know what the huge dead flowers behind this chair are; I’ll have to return later in the year and see them growing. Their leaves are the size of umbrellas! 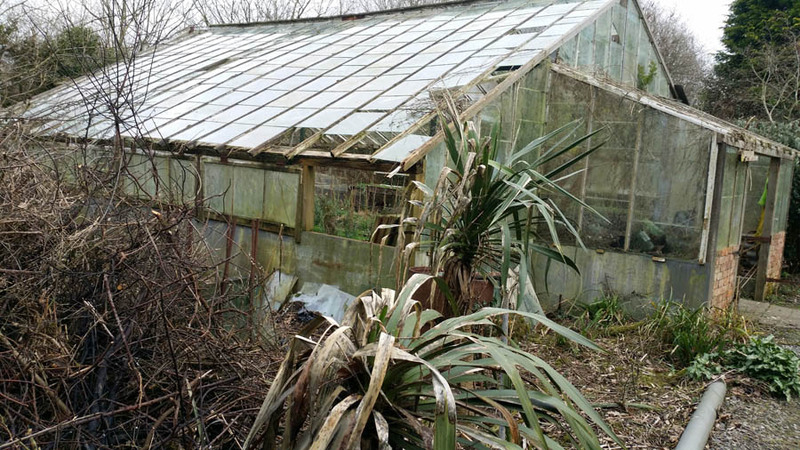 The decaying greenhouse lends an apocalyptic air to the place, along with the greening statues. I’m definitely coming back in the summer for a picnic in those shady groves! If you’d like to visit Towntree Farm, and marvel at how much difference one man can make, there are instructions here. Compared to a grass pasture of the same size, the Nature Garden clearly holds a lot more water. This is restrained by the natural features re-created here, protecting land further downstream during times of flood. The Towntree Farm project has always been a hobby, laid out simply for the delight in nature. 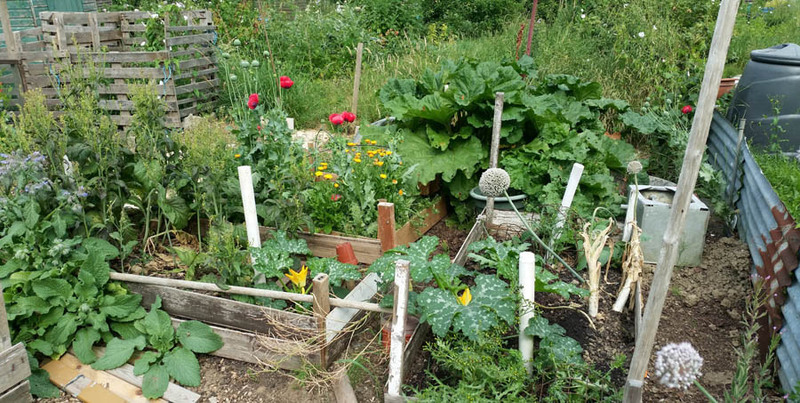 Using permaculture and forest gardening principles, other such gardens could justify their existence with some financial return. 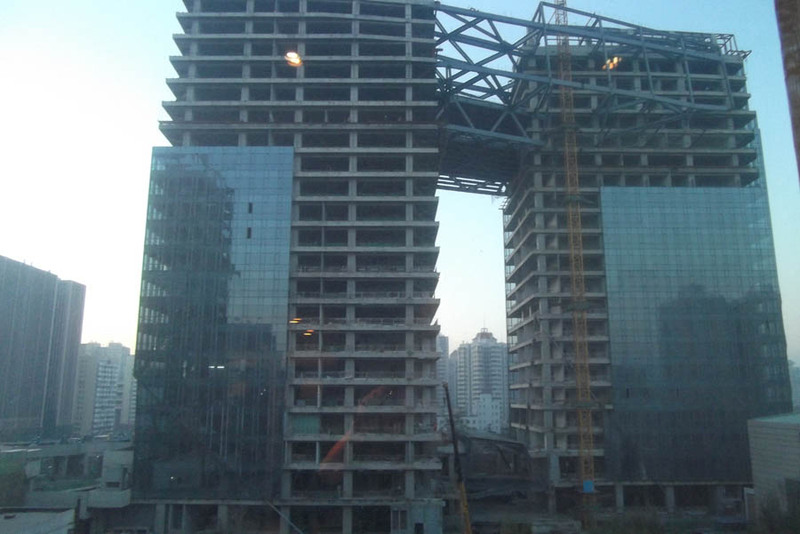 We left the Grand Dynasty Culture Hotel and drove through the choking smog of the morning rush hour to Xi’an airport. We had a lot of turbulence on the flight to Beijing, but landed safely and were whisked off for more sightseeing. It was much colder here; the ‘maybe later’ marketeers sold fur-lined Mao hats and warm gloves. 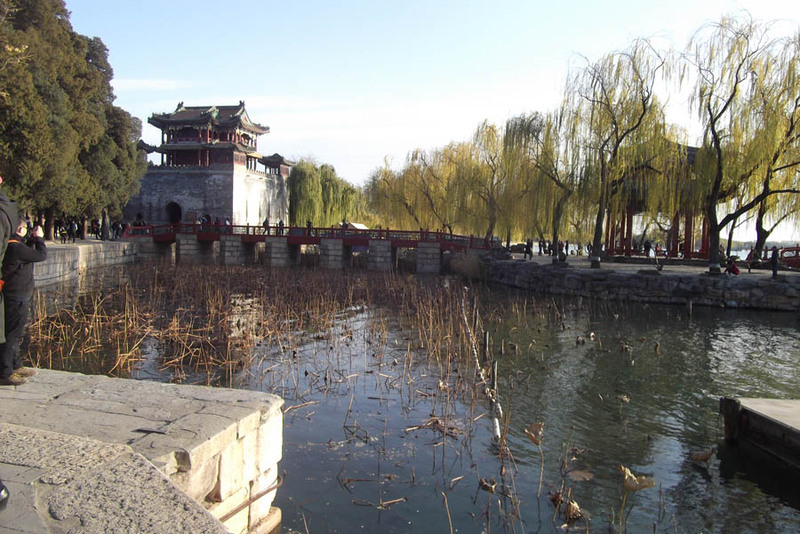 Tired from the flight, it was difficult to properly appreciate the beautiful Summer Palace. The Dragon Boats were moored for the winter; in the summer season, these rowed out on the lake. 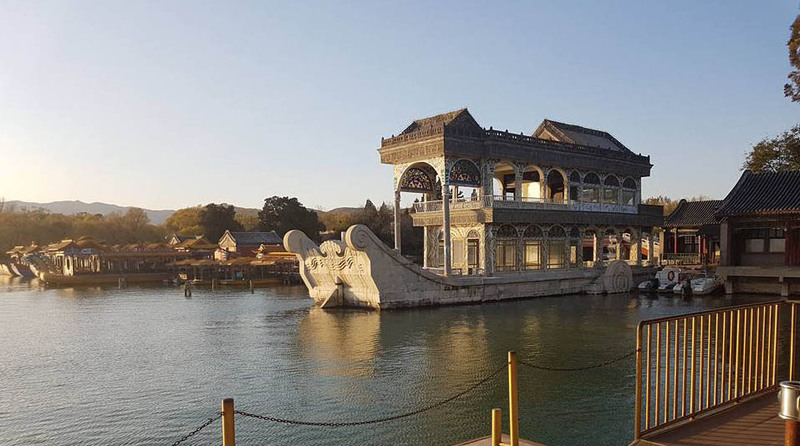 Once, the entire court used to sail between the Palace and the Forbidden City. Although our own camera batteries were nearly done, we did feature in a lot of photos. Despite the crowds, there were very few Westerners here, and we were a centre of covert attention every time we stopped. 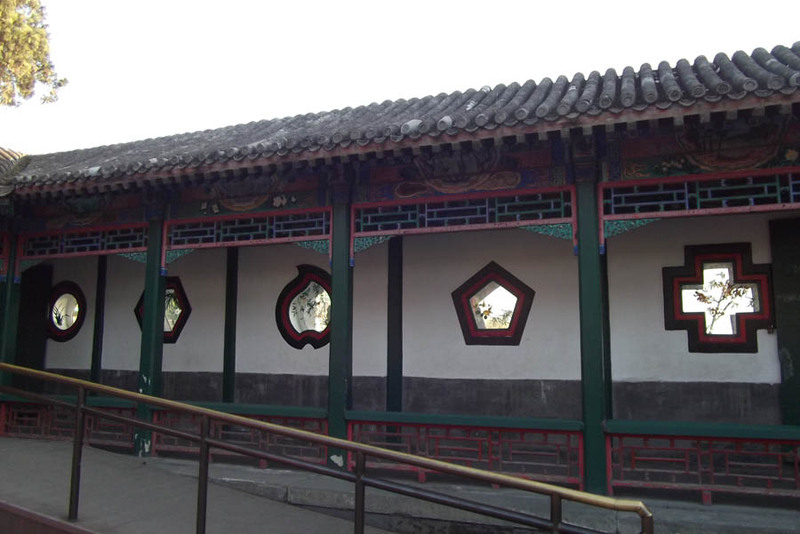 We crossed the Palace grounds at a brisk walk from East Gate to North Gate along painted cloisters (restored after the Opium Wars of 1860) used by the Empress Cixi. She was the widow of the Emperor, and ruled for 48 years until her death in 1906 at the age of 73. Her son predeceased her. The sun set behind hills on our way to the hotel. Autumn had been and gone here, the leaves already fallen; it seems quite abrupt. We were in a Mercure hotel, out on the fifth ring road of seven. Security was high; there was great confusion in the lifts before everyone realised you had to swipe your room card before you could select a floor! The next day was to be a long trip to the Great Wall, which was apparently even colder than the city. Linda needed a hat and gloves; we were both out of camera batteries. There was rumoured to be a supermarket just opposite the hotel; we were highly motivated to go out and look for it. Careful to pick up a ‘please take me home’ card from the hotel reception, and take a photo of the entrance, we set off. There was nothing but a large empty courtyard behind the buildings directly opposite; we headed for the road and turned left, away from the hotel. Most of the high rise surrounding us were decorated with coloured lights, so it was quite easy to identify landmarks. At the next intersection, we risked another perilous crossing – you have to watch out for cars turning into your road, even when pedestrian lights show green. The cycles and scooters are in a world of their own when it comes to traffic control, but they travel quite slowly. Spotting a Pizza Hut in the distance, we made for that, and found a large shopping mall tucked away behind it. Our quest for a cheap hat led us deep inside, past the designer outlets, right to the far end. Here, we found a Carrefour sign and an escalator down to the strangest supermarket I’ve ever seen! Camera batteries and gloves secured, we turned our attention to food. The mystery vegetables served at dinner were displayed in heaps; so much fresh meat was out that it was a wonder what they did with it at closing time. Bread and a profusion of little cakes were supplied by an in-store bakery; there was a selection of chocolate and biscuits, some of which were actually familiar. Back at the hotel bar, we heard the tales from our fellow adventurers. Some people had found the supermarket; many had missed it and found other places; nobody got entirely lost! 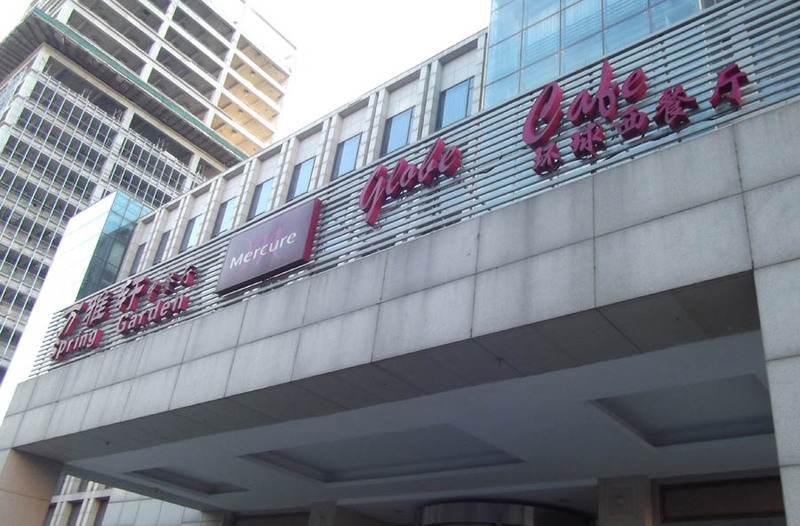 In China, the culture is to buy rather than rent. A boy’s family must be able to purchase a property and pay for the wedding, or no girl will marry him. The families like to plant trees for their children in order to make furniture for their new home. Although Ikea is an important source, one or two pieces should be traditionally crafted to ensure a long marriage. The relaxation of the one-child policy, dating from 1979, allows only children to have a second child without the usual massive fine. This is to help with elderly care, though youngsters employed by private companies are reluctant to take it up as they fear losing their jobs. Generally both parents must work, but childcare and schools are good.